Okay, here we go! Welcome to post #401. As mentioned yesterday, today’s post will be a quick and efficient look at all of the Shadowland tie-ins that remain before I’ll be ready to look at Shadowland: Spider-Man #1 on Thursday. Wow. Okay, let me put that a different way: I came to this issue bemoaning the fact that I even had pay money for a title with Ghost Rider in it. I’ve always found the character to be much too bizarre for my tastes (his head is a flaming skull and he rides around on a motorcycle…) and couldn’t imagine that I’d find much to like about this issue, especially considering his role in Shadowland. Well, I must hand it to Rob Williams and say that he proved me wrong. it is, in fact, possible to write a story about Ghost Rider that strikes me as not only entertaining, but very meaningfully integrated with the larger story. 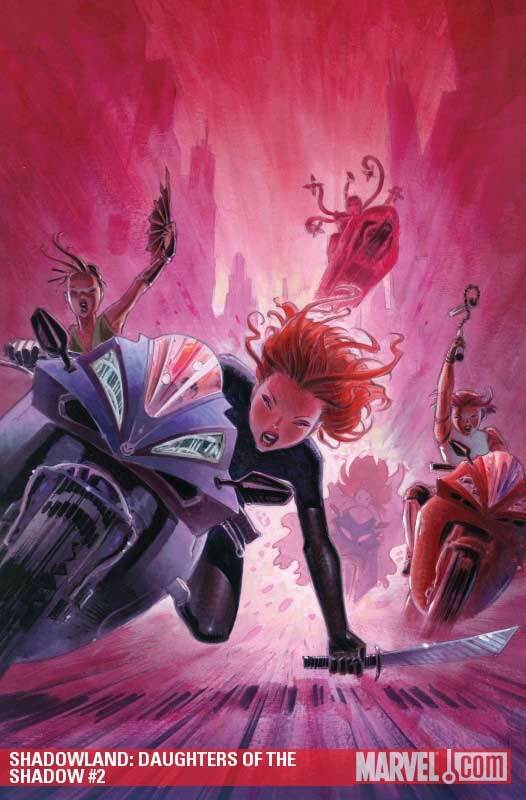 It all starts with Ghost Rider returning to the Kingpin and Lady Bullseye after first breaking into Shadowland and the story then follows him to Japan where he is sent by Fisk to destroy the leadership of the Hand. Between the magic and the mind control he is forced to pull out a few tricks and the events of the latter half of the issue should have some pretty major ramifications going into the final stretch of the larger event. The near photo-realistic art is probably not everyone’s cup of tea, but I must say that I really like it. It’s especially powerful in this kind of story where the plot itself revolves around such mystical and exotic concepts that a high degree of realism helps maintain the suspension of disbelief. Good issue all around! This little title is coming along nicely and this issue gives us plenty of action to go along with the pieces of the puzzle falling nicely in place. The issue starts with a background on the relationship between Vic and his father and shows the conversation they have just before their building collapses in the explosion we saw in the Daredevil’s Dark Reign: The List one-shot. Vic’s father dies while he miraculously survives. 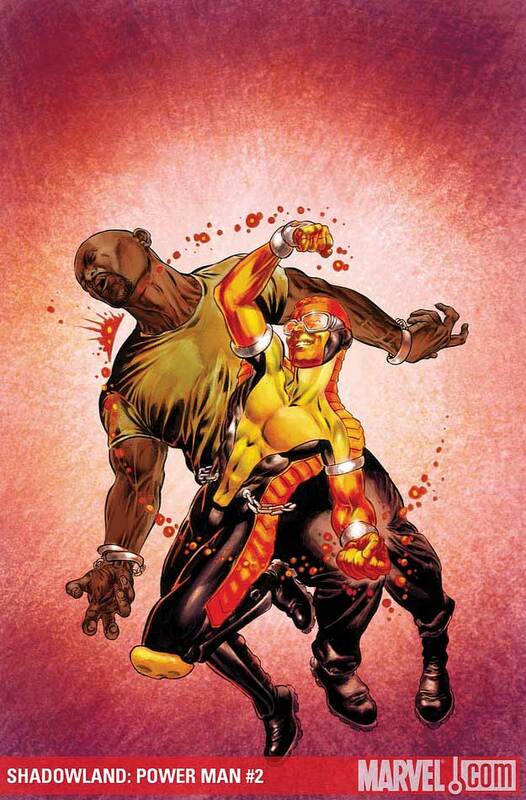 We also learn the source of the new Power Man’s resentment toward his older namesake when the story cuts back to last issue’s fight between Vic, Danny and Luke. This provides a nice examination of the new hero’s powers and Danny is visibly shaken, and intrigued, to realize what he can do. The threats to Vic’s safety start piling up though when old enemies from the first issue begin to go after him. This includes the Hand. All in all a nice second issue with great art and plenty of layers. 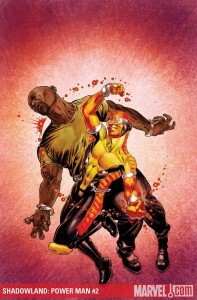 Van Lente skillfully connects the dots and ties Vic’s identity and origin to past Luke Cage continuity while still being mindful of the Shadowland backdrop against which this mini-series is set. I’ve been reading the Thunderbolts regularly for quite a while and am a huge fan of what Jeff Parker has been doing on this book. Having said that, this issue didn’t really blow me a way. I’m sure the reward will be decent enough next issue, but so far we’re just not far enough into the heat of things for me to feel like it was a completely satisfying read. I’m divided on Declan Shalvey’s art. I like his faces and angles a lot, but what’s with the spiky hair on some of these characters? This is something I’ve noticed before and it makes some of the cast look odd when the rest of them look fine. Anyway, this was a good read, but not a great one, and we’ll see next issue how the team fares after finding themselves trapped in the tunnels below Shadowland. The biggest problem for me with The Daughters of the Shadow is its basic raison d’être. It feels like it exists purely for its coolness factor, or because someone decided that “hey, we need to have a girl team in there somewhere.” The idea behind The Nail, the all-female legacy Hand hit squad which is at the center of the story, doesn’t seem to be particularly well motivated by the main event, nor does it seem to have any major impact on Shadowland as a whole. Having said that, I would also point out that this kind of set-up is hardly unique, lots of event tie-in titles seem to follow the same kind of logic. I would also say that, these relatively minor qualms aside, this is actually a pretty good issue and more exciting than last month’s installment. Here, we get to see all the girls do their thing and learn a little more about them. In this issue’s most interesting development, we also get to see Colleen Wing come face to face with her own doubts regarding the morality and consequences of what she’s gotten herself involved in. Based on the insight she gains into Daredevil’s new way of doing things, she makes a fateful decision that puts her in grave danger. I’m still not a huge fan of Rodriguez’s art, but feel it’s a step up from last issue. On the whole, I’m looking forward to next issue when I suspect things might really start to get interesting. I found last month’s issue a little hard to follow. Not so this time. 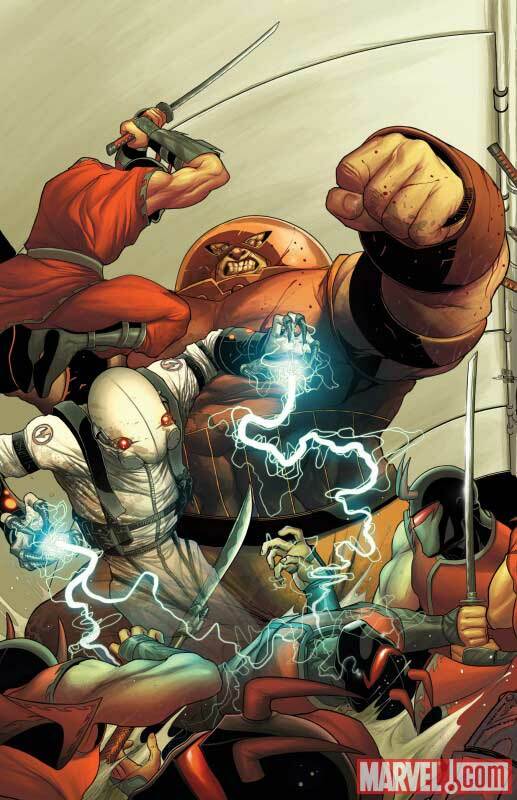 The events pick up where we left off last time, with Moon Knight suddenly finding himself embroiled in the fighting going on inside Shadowland. This brings him into close contact with Daredevil himself, close enough to get a sense of what it is that has invaded Matt’s psyche. He also has Khonshu at his side, who reveals that there is only one thing in the world capable of killing the Beast, an sapphire crescent. 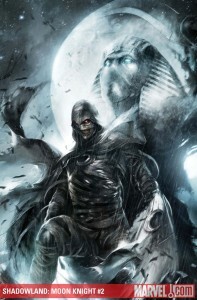 In order to get to the crescent, Moon Knight has to find Shadow Knight and this leads us back to the other events of last issue, which saw the appearance of a new villain. Here, it is confirmed just who this villain is and Hurwitz gets another chance to explore Moon Knight’s past and give potential new readers out there some more insight into the character. Bong Dazo’s art works pretty well for me overall, but I find certain scenes a little hard to follow and some of the characters’ anatomical features are perhaps a little over the top. This is a matter of personal taste, however. This issue made the whole mini a lot more interesting and it’s easier to see the connections to the main event. As we’ve already seen with Shadowland: Ghost Rider, quite a few pieces of the larger puzzle are planted in these tie-in books. Not a stellar issue, but not because of the story itself, but due to the fact that this is, above all else, a Spider-Man issue. Not that there’s anything wrong with that, per se, but it adds very little to the overall event and even seems written specifically for Spider-Man fans. What happens in this issue is basically that Spider-Man takes a break from the “what should we do about Matt?” meeting and is joined by Shang-Chi. Together they fight Spidey foe Mr. 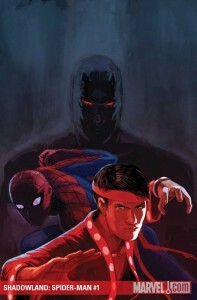 Negative, and Shang-Chi falls prey to his inner dark side. 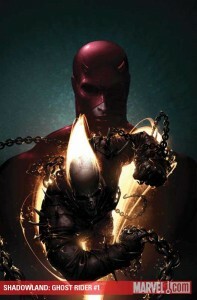 Peter then has to break his spell and bring him back into the ligth, which thematically touches on Daredevil’s descent into darkness. The issue stands well on its own and is enjoyable enough, but – as I’ve touched on already – it seems to use the Shadowland event more as an alibi to be able to sell a Spider-Man story. The art is pretty good, not much more to say about that. I didn’t buy any of these tie-ins, but I just read Shadowland #4 and couldn’t be more bored and angered by this event. I was either going to read this or Chaos War…needless to say, I picked the wrong event. DD Reborn had better be phenomenal.